Dori is intelligent, affectionate, brilliant red and black with a fantastic championship pedigree. Dori is the daughter of VA1 world champion Chakira vom Pendler. She is also a world famous World Vize Sieger VA2 Quenn vom Löher Weg SchH3, IPO3 (paternal) granddaughter and a VA1 Pakros d'Ulmental SchH3, IPO3 (maternal) granddaughter. Georgia is our newest “Mom in Training” who will begin her Schutzhund training this year and compete in 2017 and have litters later in 2017. She is a loving, affectionate brilliant red and jet black puppy with a spectacular pedigree. She is a world famous VA1 Remo von Fichtenschlag granddaughter and a World Sieger VA1 Larus von Batu and World Sieger VA1 Yasko vom Farbenspiel granddaughter. Kada is a beautiful, spirited, perennial puppy with a heart full of love. She is a V titled show dog, a Vize World Sieger VA2 Quenn von Lower Weg IPO1 granddaughter with the great Ursus von Batu, Netun von Bad Boll, and Ulk von Arlett in her pedigree. 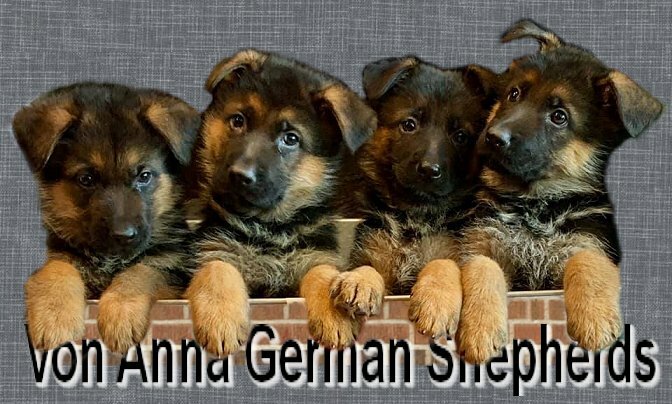 Anna brings excellent German Shepherd conformation, exceptionally loving disposition, and rich red with jet black to her litters. She is spectacularly beautiful and literally stops passers-by on the street with her beauty. Anna is the first generation daughter of VA1 NASS Sieger Champion Tuareg von Bad-Boll and VA3 Xyra vom Drei Birkenzwinger and has 2X VA1 Larus von Batu, 2X VA1 Yasko von Farbenspiel, VA1 Yello von St.-Michaels-Berg and many other world champions in her pedigree. She competed for SG and earned her Schutzhund training in 2017. Nelly is a beautiful dog just beginning her show career. She has World Champion Siegers (2006) Zamp von Thermados and (2000) Ursus von Batu and top producers VA Dux Della Valcuvia and Esko in her pedigree. Vee is especially beautiful with her brilliant red and special tan and silver lines in her jet black top coat. She is a World Sieger VA2 Quenn vom Loher Weg and VA Negus granddaughter and brings the lines of famous VA1 Ursus von Batu and famous VA1 Zamp von Thermodos in her pedigree. Viktoria is a beautiful long coat female with many world champions in her pedigree including the famous 2X VA1 World Champion Vegas du Haut Mansard and World Champion VA1 Pakros d' Ulmental. She brings beautiful deep black and red long coat features and an exceptionally loving disposition to our kennel. 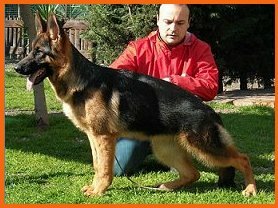 Xena is a beautiful black and red champion female with one the finest pedigrees in the world. She is a V1 show champion. She is the granddaughter of VA Furbo Degli Achei son of the great VA Quenn vom Loher Weg. She has the great Zamp von Thermados, Ursus von Batu, and Hill von Farbenspiel in her pedigree, a who’s who of the greatest producing champions in recent history. Zoe’s pedigree is a "who's who" of many famous German top producers including 2x World Sieger VA1 Yasko vom Farbenspiel SchH3, Kkl 1a, Nicos, World Vize Sieger VA2 Quantum von Arminius SchH3, Kkl 1a, VA1 Zamp vom Thermodos SchH3, Kkl 1a, V Dux de Cuatro Flores SchH3, Kkl 1a, World Sieger VA1 Pakros vom d' Ulmental, Vegas; Plus many other VA producers including VA Esko von Dänishchen Hof, VA Nero vom Nobachtal, VA Enzo vom Buckhorn , VA Yello v. St.-Michaels-Berg, VA Nando vom Gollerweiher, and VA Mentos vom Osterberger-Land.